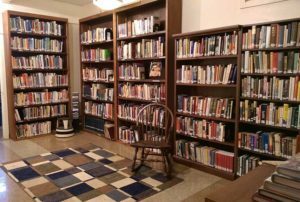 We are a People of the Book, and at TEMV, we are excited to support our Jewish lives with many books in the TEMV library. Want to learn more about Jewish history? Need advice about a life event? Feel like reading a biography of Leonard Nimoy? Looking for commentary on this week’s Torah portion? Want stories by authors as diverse as Chaim Potok and Faye Kellerman? Seeking new recipes for Passover? Our thousands of books for adults and children of all ages include works on Jewish culture, thought, observance, languages, history, genealogy, art, parenting, life events, and cooking, along with biographies, short stories, and novels. Our children’s collection begins with sturdy board books for the very youngest and extends to novels, biographies, and books on Jewish holidays, practice, and culture for older children and teens. We invite you to browse our collection and check out ones that will inspire and inform you! Simply write your name, the book title, and date in the notebook by the library door (for the adult collection) or in the notebook on the shelf above the Religious School cubbies (for the children’s collection). Return all books to the marked bin next to the Religious School cubbies. Most sections are alphabetical by author’s last name, except for biography, which is by subject’s last name. The Jewish Holiday section is organized by holiday, then author. We’re also always looking for donations to build the collection. Because our shelf space has limits, however, we ask that books relate in some way to the Jewish experience, broadly speaking — including Jewish culture, faith, history, or the perspective of Jewish authors — or works that offer comparative insights into other faiths. We may also offer donated books back to the TEMV community if we already have multiple copies.